The tensile test can reveal several important engineering properties of materials. These properties are strength (yield point, yield strength, and tensile strength) and ductility (elongation and reduction in area). The strength and ductility of metals are generally obtained from a simple uniaxial tensile test in which a machined specimen is subjected to an increasing load. The stress (load divided by the original cross-sectional area, N/mm2 or MPa) can be plotted against the strain (elongation divided by the original gage length, %) as shown in Figure 1. In Figure 1(b) the straight solid portion (the straight modulus line) of Line A-A’ traces the specimen elongation over the original gage length with increasing stress. 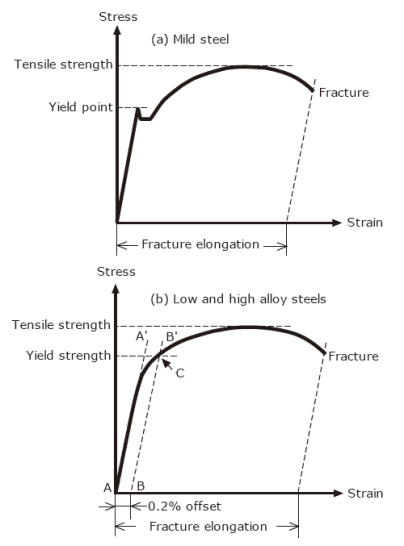 This linear proportionality between stress and strain represents Young’s modulus (modulus of elasticity) for the metal tested. 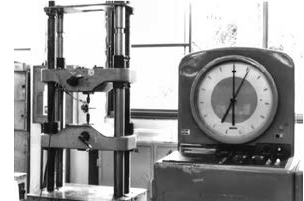 If the load on this tension specimen is removed at any point along the straight modulus line, then the specimen length will return to its original dimension; thus absolute elasticity is demonstrated by the metal. Note Point B on the strain axis, and draw a line from there to Point B’ parallel to Line A-A’. The point C, where the 0.2% offset line (BB’) intersects the stress-strain curve, is the 0.2% offset yield strength. As for weld metal, the characteristic of yielding is similar to that of the steel materials mentioned above. That is, filler metals for mild steel (E6019 and E6013) display the yield point on the stressstrain curve of the weld metal, while filler metals for high strength, heat-resistant, and stainless steel exhibit no yield point on their stress-strain curves. Therefore, in the latter case, 0.2% offset yield strength is used as shown for individual brand data in Kobelco Welding Handbook. In the design of steel buildings and bridges, yield strength is used for the standard strength to develop the allowable stress according to the specified safety factor. In the case of pressure vessels the allowable stress is developed based on yield strength as well as tensile strength according to the service conditions.